Some writing (with a nod to thermodynamics) that didn’t make the cut in my book proposal. So, I’m just finishing up a non-fiction book proposal for my agent and initially I had the below text as an entry point. In the end, I ditched it because I decided to instead use a personal anecdote about a child and her unicorn questions. Anyway, I still kind of like the below, so it seemed a shame not to show it off somewhere. The book you are holding in your hands follows the laws of thermodynamics. This is possibly something you take for granted, or more likely, it is something you are not familiar with – maybe because of the use of terminology foreign to you. Nevertheless, it is a reality that informs some of your expectations of this book. You assume, for instance, that the book will not spontaneously turn into an elephant – no matter how fond you might be of elephants. You also assume that the book will not leap away from your hands, unless, of course: (1) you hurl it away yourself; or (2) you are surprised by an errant gust of wind; or (3) you are accosted by an excitable neighbour (perhaps an elephant?) who physically snatches it from your hands and throws it across the room. Although all of these silly assumptions sound obvious, it is the laws of thermodynamics that encapsulate some fundamental science necessary to translate them into elegant conceptual and mathematical descriptions. Furthermore, these elegant laws work everywhere. More importantly, the moral of our fable (and we can call it a fable because of the involvement of our elephant) is that often we find that obvious assumptions can also be obviously explained by robust scientific concepts. But what if the assumptions are not so obvious; what if they are confusing even? What if you are getting information from a variety of conflicting places? What if someone you trust told you that there is value in eating this book. They tell you that ingestion of this book will cure cancer, or that it will make you rich, or that it might even earn you a pet elephant. What if they tell you that they know this to be true, because they have “seen it with their own eyes?” At this point, a person might use a variety of different criteria to judge this assumption. How much do I trust this individual? Is the individual knowledgable? What is the evidence involved? How good is the evidence? How badly do people want the assumption to be true? Should this matter? All of these criteria sound reasonable, and presumably if you use them, you would come to the conclusion that maybe eating this book isn’t such a good idea. Yet, interestingly, when people are poised with numerous day to day claims about the world, they don’t always think to use all of these criteria. In fact, sometimes decisions are often made by quickly skimming through these criteria, or focusing on only one of them. In particular, many people evaluate these assumptions without looking deeply at things like the expertise of the source, or the soundness of the evidence. Which is unfortunate, since this is really an ignorance of the scientific process, a way of obtaining knowledge that has fundamentally changed the course of human history, and has provided us with information to make sense of the physical world around us. This process isn’t always the best way to evaluate claims – religion and philosophy may have more pertinent roles in questions about how the book might move your soul, or what the purpose of this book is – but for many scenarios, where there are empirical things you can measure and see, it’s a pretty decent way to evaluate your options and make good important decisions. Then, of course, there is the issue of forgetting the roles that science plays in almost everything you do and everything you have. This is something you already know, but don’t really think about: that the vast majority of your activities and objects past have been historically informed by both scientific concepts and the scientific process; and that the vast majority of your activities and objects future will be informed by new scientific concepts and society’s continued participation in the scientific process. This book, for instance, didn’t materialized magically. Intellectually, the words were recorded on a computer, and an author’s health is maintained by medical research. Physically, there were players from biodiversity (the pulp from the trees, the dyes to create the ink) and advances in publishing technology involved (the printing press, distribution mechanisms). But these science-centric things are, in the best case scenario, often forgotten, and in the worst case scenario, are deliberately hidden from us. It’s as if science literacy isn’t worth acknowledging. The scientific way of thinking is being ignored. 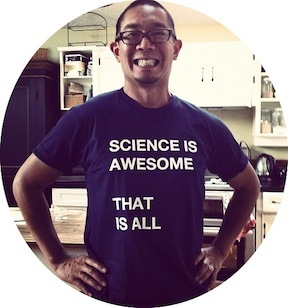 The world is crying, “Sciencegeek down” without an afterthought. This book’s assumption is that this isn’t a good thing. And that, dear reader, is the real elephant in this room.